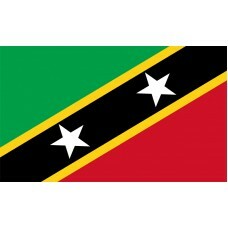 The St. Kitts and Nevis flag features a black diagonal band (beginning from the bottom left-hand corner of the flag, to the top right-hand corner of the flag) that contains two white stars and has a yellow border. The top triangle is green and the bottom triangle is red. The green color represents the agriculture, the red color represents the country’s fight for freedom against slavery, the yellow color represents the sunshine that the country regularly sees all year round, and the black color represents the people’s African origins. The two stars represents Saint Christopher and Nevis (the two islands) as well as representing hope and liberty. The St. Kitts and Nevis flag was designed by student, Edrice Lewis, following a national competition that was held to design the flag. The St. Kitts and Nevis flag was officially adopted on September 19th, 1983, on the day that the country gained independence. 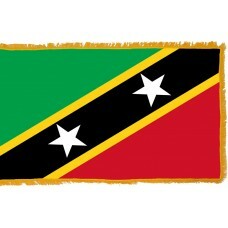 St. Kitts and Nevis is a dual-island nation (St. Kitts is larger than Nevis) that is located in the Caribbean Sea. Both the islands that form the nation were formed by volcanoes. The capital is called Basseterre (which translates as lower ground) and is one of the oldest towns in the Caribbean, which was founded in 1627. St Kitts and Nevis is also known as "Sugar City" as it was known throughout the years as being a sugar-cane island. St. Kitts and Nevis is a country that has been under the control from the British for many years, but it was first inhabited by Kalinago (carib) Indians and was called ‘Liamuiga’ which translates as "fertile land." In 1623, the British settled on St. Kitts and in 1628, they settled on Nevis. In 1627, the French settled on St. Kitts and rivalry between the French and the British began and continued for over 100 years. 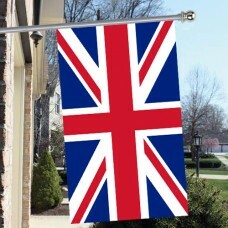 In 1782, following the British victory over the French at Brimstone Hill, Britain gained full control of the islands until they gained independence in 1983. St Kitts and Nevis is thought to be the oldest colonized territories in the Caribbean. Saint Kitts is sometimes referred to as "The Mother colony of the West Indies" as it was the home of the first British and French colonies within the Caribbean. St Kitts and Nevis economy and income is mainly from agriculture and tourism. 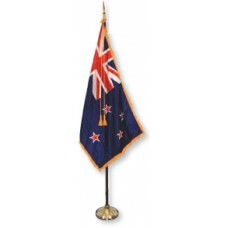 It is a very popular destination to visit due to the history that the country contains. The most famous attraction is the "Brimstone Hill Fortress," which was built in 1690 by African slaves. It was initially built to protect St. Kitts. The Sugar Train is another popular attraction. It was originally built between 1912-1926 and was built with the intention of using it to transport the sugar from plantations to the factory. Today, it is used as a passenger train to explore some of the island.